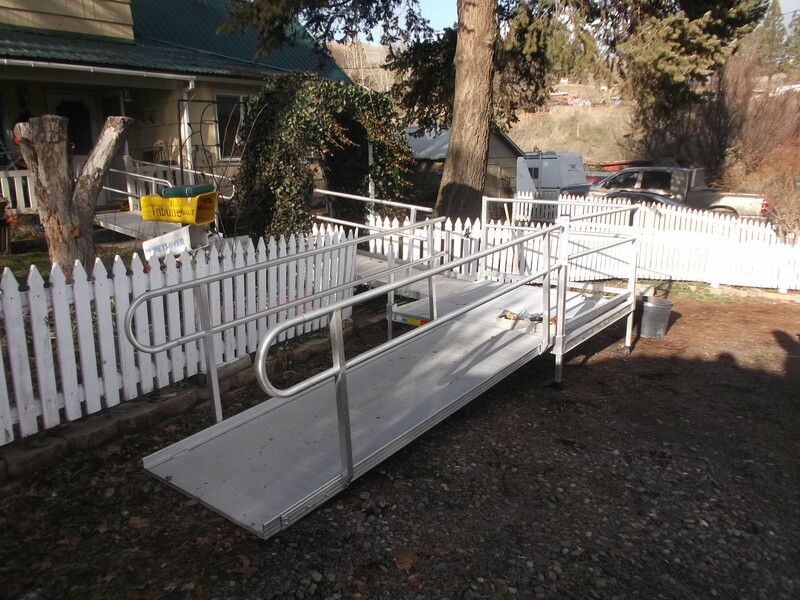 A fairly complicated ramp was installed for a home owner in Julietta in January. An 8′ ramp came off the porch and onto a 5’x5′ landing. The next 8′ ramp went from the platform through an ivy-draped trellis to a second 5’x5′ platform. And a third 9′ ramp came off the lower platform at a right angle, down to the gravel driveway. Handrails were installed where it was possible, given the very limited parts that are left in the grant program now. The homeowner came out with her walker and tested things out. She was quite appreciative!! Habitat’s Brent Bradberry was joined by three members of the Moscow Central Lions Club; Russ Biggam, Charlie Stefani, and Larry Verdal. From warehouse to warehouse took about six hours, which totals 24 volunteer hours! The big bonus was the mild weather in Julietta. It was 48 degrees fahrenheit when they left Julietta, but only 38 degrees when they arrived back in Moscow. There have been 14 ramps installed over the past year or so, and a few of these have been dismantled and used again. 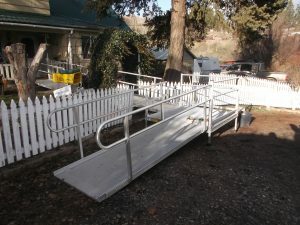 No other ramps can be built until new components are purchased or are available for re-use. A waiting list of 5 people has been started at the Disability Action Center NW.